Please join author Dalt Wonk and illustrator Simon Gunning for a book signing of Spiritual Gifts. Luna Press is excited to be exhibiting at the Louisiana Book Festival again this year, where Dalt’s new book Spiritual Gifts, will be for sale. Don’t miss this wonderful celebration of all things literary! Dalt is honored to be participating in the 2017 Louisiana Book Festival as a Featured Author. He will be presenting his latest book, The Laughing Lady, with a book signing to follow. Dalt will discuss his latest book, The Laughing Lady, with three other local authors of children’s books at Jefferson Parish Library. Dalt, along with Yvonne Perret, Bob Bruce and David Cuthbert, will discuss the processes and the unique challenges of writing literature for children. The event is free and open to the public. 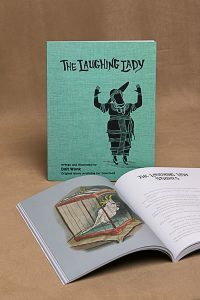 Copies of The Laughing Lady will be for sale. Hope to see you there! The Laughing Lady is here! We are excited to announce The Laughing Lady — a fantasy adventure for children 6-12 years old with original music written and recorded in New Orleans. Check it out.